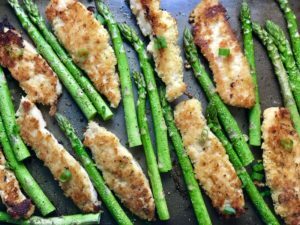 This One-Pan Parmesan Crumb Chicken and Asparagus is crispy, healthy, filling, easy, and delicious. The chicken is simply breaded with a mixture of parmesan cheese and breadcrumbs. The Asparagus is lightly seasoned with extra virgin olive oil, garlic, salt, and pepper. Finally, the scallions give a mild onion flavor. This dish is loaded with amazing but simple delicious-ness! 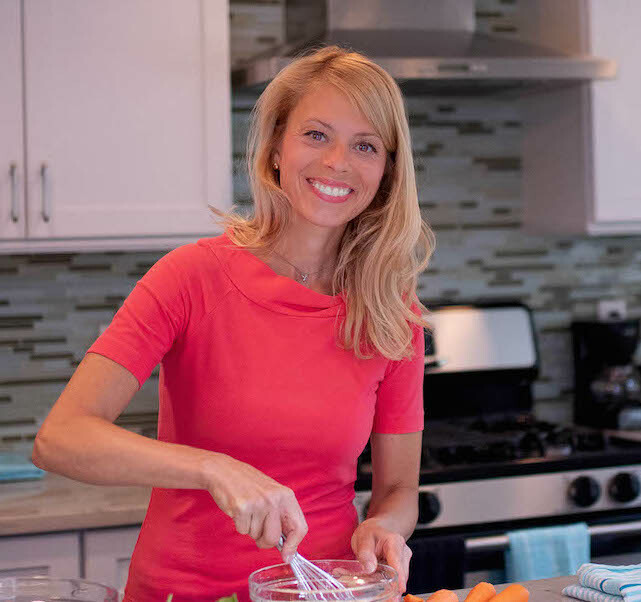 Never miss a recipe…Click Here to Follow me on Instagram! It’s Spring and time for the birds to start chirping, the flowers to start blooming, and SPRING VEGGIES! Asparagus is one of those veggies. Asparagus crops are harvested from late February to June, with April being the prime month. That means, IT’S TIME FOR ASPARAGUS! 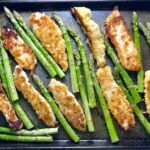 Do your kids eat asparagus? Roasting it brings out all of the natural sugars, gives it a soft enough texture, but also an almost crispy-crunchy outside so that kids can pick it up and eat it like french fries. For my kids, being allowed to pick up food with their fingers ALWAYS increases my chances of successfully getting them to eat it! 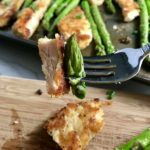 Why eat Asparagus? It’s SUPER GOOD FOR YOU! Not only is it low in calories (ehem, for those of us that caught a glimpse of ourselves in swimsuits over spring break and are now trying to lose a few more of those winter pounds🙄) it is loaded with vitamins like A, C, E, K, and B6, as well as folate, iron, copper, calcium, protein, and fiber (Health.com, 10 Reasons Why You Should Eat More Asparagus). You are busy, so these are the steps you can do a day or two in advance to prepare food ahead! To start, I like to use a large bowl or small sheet pan for storing all of the ‘kit’ prepped food on. First, rinse the asparagus and cut off the woody ends. 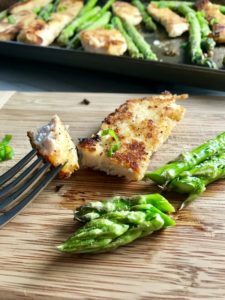 Place the asparagus in a 1 gallon sealable bag and toss with 1 tsp extra virgin olive oil, 1/2 tsp garlic powder, salt and fresh ground pepper to taste. Next, slice the scallions into thin strips and put in a small storage baggie. Then, mix the parmesan cheese, breadcrumbs, salt, and fresh ground pepper and place in bag. Slice the chicken breasts into 1 inch wide strips and put in a 1 gallon sealable bag. Now place all baggies and 1 egg on the sheet pan for storing in the fridge. Preheat the oven to 400 F degrees and spray a large sheet pan with olive oil cooking spray. Pull your ‘kit’ out of the fridge. Crack the egg into a medium size bowl (big enough to fit a couple pieces of chicken at a time). Next, in a separate bowl of similar size, pour in the parmesan-breadcrumb mixture. 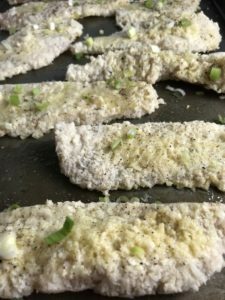 Dip each chicken strip into the egg wash and then coat with the parm-breadcrumbs. Then place on sheet pan that has been coated with olive oil cooking spray. Spray the top of each chicken piece lightly as well and then put into oven. After the chicken has cooked for 15 minutes, take it out and flip each piece over. Then and add the Asparagus to the pan with the chicken and put back in the oven for another 15 minutes. The Chicken will be browned and crispy on the outside, moist and tender on the inside. The asparagus will be slightly tender, but still slightly crisp and fresh with a delicious gentle roasted char to the outside. Get the detailed recipe below…ENJOY!! 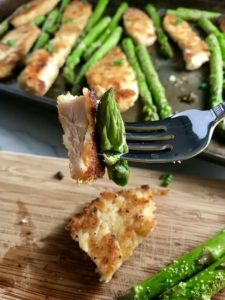 This One-Pan Parmesan Crumb Chicken and Asparagus is crispy, healthy, filling, easy, and delicious. The chicken is simply breaded with a mixture of parmesan cheese and breadcrumbs. The Asparagus is lightly seasoned with extra virgin olive oil, garlic, salt, and pepper. Sprinkle the entire pan with scallions for a mild onion flavor and this dish is loaded with amazing but simple delicious-ness! Get a large bowl or small sheet pan for storing all of the 'kit' prepped food on. Note, this is not the bowl/pan you will necessarily cook with later as you need a large sheet pan for cooking and that may not be ideal for storing in your fridge. Rinse the asparagus and cut off the woody ends, usually this will be about 1 inche off the end. 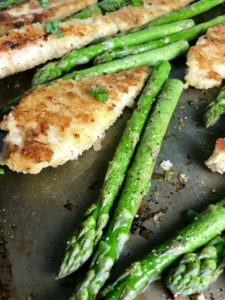 Place the asparagus in a 1 gallon sealable bag and toss with 1 tsp extra virgin olive oil, 1/2 tsp garlic powder, salt and fresh ground pepper to taste. 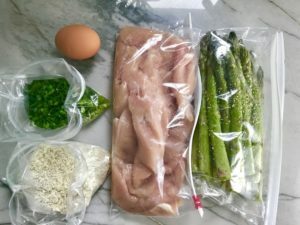 Place bag on sheet pan for storing in fridge. Slice the scallions into thin strips. Put in small baggie and place on sheet pan for storing in fridge. Mix the parmesan cheese, breadcrumbs, 1/2 tsp salt, and 1/2 fresh ground pepper. Slice the chicken breasts into 1 inch wide strips and put in a 1 gallon sealable bag. 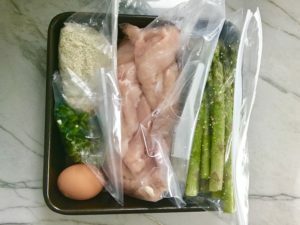 Place bag on sheet pan for storing in fridge. Place 1 egg on the sheet pan for cracking when you are ready to cook. 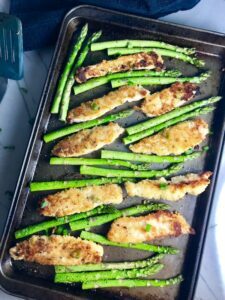 Now on your storage sheet pan you will have: 1. bag of seasoned asparagus 2. bag of sliced scallions 3. bag of parm-breadcrumb mixture 4. bag of cut chicken strips 5. one egg. The only thing left is the Extra Virgin Olive Oil, which you do not need to put on the sheet pan. Preheat oven to 400 degrees F and spray a large sheet pan (I used an 18 inch) with olive oil cooking spray. Pull your 'kit' out of the fridge. Crack the egg into a medium size bowl (big enough to fit a couple pieces of chicken at a time). In a separate bowl of similar size, pour in the parmesan-breadcrumb mixture. 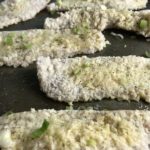 Dip each chicken strip into the egg wash and then coat with the parm-breadcrumbs. Then place on sheet pan that has been coated with olive oil cooking spray. Spray the top of each chicken piece lightly as well. Sprinkle 1/4 of the scallions over the chicken, then place in the oven for 15 minutes. After the chicken has been in the oven for 15 minutes, take the pan out and flip each piece of chicken over. Then add the asparagus to the pan, in and around the chicken. Sprinkle another 1/4 of the scallions over top and put back in the oven for another 15 minutes. After a total of 30 minutes in the oven, the chicken should be completely cooked through...browned and crispy on the outside, moist and tender on the inside. The asparagus will be slightly tender, but still slightly crisp and fresh with a delicious gentle roasted char to the outside. Let sit for a few minutes before serving. No additional sides are needed for this absolutely simple, satisfying, and delicious dish! Enjoy!